Careful research over the last tens of hours has convinced us that PunditFact reports less accurately than PolitiFact. On Jan 27, 2015, PunditFact posted an article about an update for PunditFact's networks scorecards. PunditFact falsely reported that its scorecards check "all claims made by pundits on air." We noted that announcement with a post that same day, linking to an archived version of the story. But the mistake remains as of this writing. 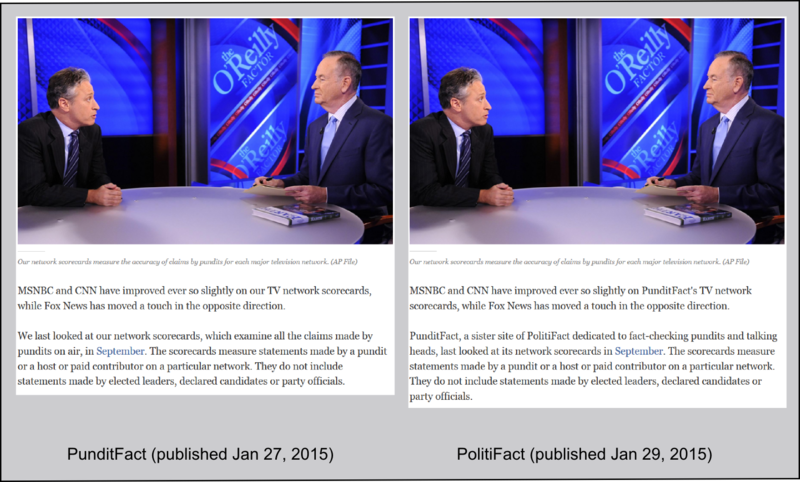 On Jan. 29, 2015, PolitiFact posted an article covering the same subject matter, coming to identical conclusions but without the claim that the scorecards check all claims made by pundits on air. Of course we're just having fun with this at PolitiFact's expense. PunditFact is simply a part of PolitiFact, the part that focuses on rating statements from pundits. PunditFact posted the faulty story, then PolitiFact posted the same story two days later with the false statement amended. I guess that way there's no need to publish a correction notice or fix the version of the story containing the error. It's enough to have one version of the story published without the mistake.